Mikki Pet have a huge range of brushes, some of which I've used in the past. But this is the first time I've used the Go Gentle On Me grooming range. This range is perfect for pets that are not used to being groomed and those who are nervous when they are groomed. It's also ideal for dogs and cats with sensitive skin as the brushes and other tools are very gentle. The range includes brushes, gloves and shampoos. 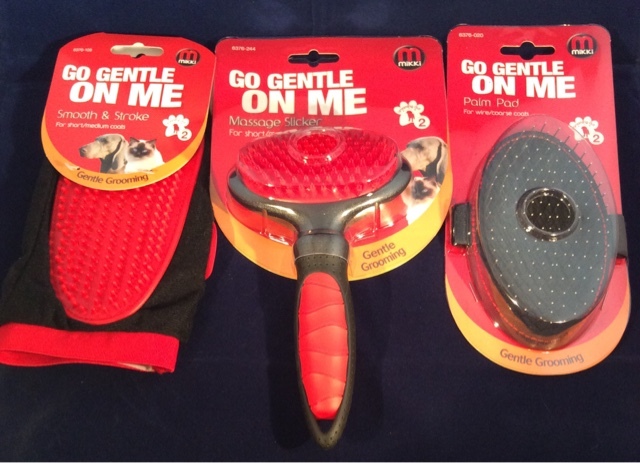 We have tried three products from this range - the Massage Slicker, the Smooth and Stroke and the Palm Pad. Dottie is not a big fan of being brushed. She's a one year old chihuahua and she has very short, fine fur. Traditional dog brushes are much too scratchy for Dottie, so this softer, gentler brush is ideal for her. Dottie actually enjoyed being brushed with the Mikki Massage Slicker - I think this must be a first for her as she usually hates being groomed! 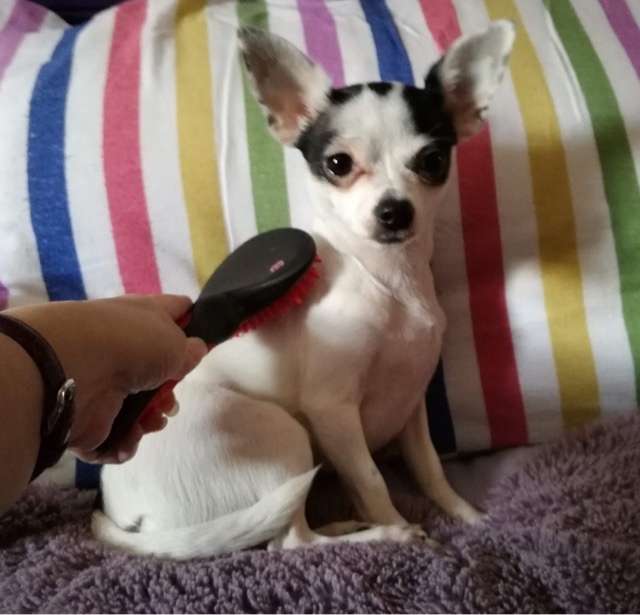 I tried the brush against my skin to see how it felt, and it does feel like a massage and it must be much more pleasant for dogs and cats than regular brushes that can scratch or pull. It surprised me by how much fur it actually removed. Dottie had been moulting when we tried this brush and it removed a lot of dead and loose hair. The Mikki Massage Slicker left Dottie's coat looking and feeling silky smooth. 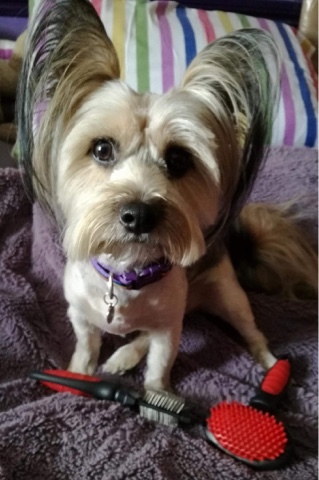 We also tried this brush on Rolo, our two year old Yorkshire Terrier. Most of his coat is currently clipped short, but he has very long hair on his ears and tail. The Massage Slicker worked very well on his body fur and also surprisingly well on his ears. The only difficulty that I have found with this brush was getting Dottie's tiny hairs out of it due to the brush's rubbery texture. But that's only one small negative against lots of positives. The Mikki Massage Slicker is lightweight, good quality, great for dogs who need a gentler brush and effectively removes loose hair from your pet. I definitely recommend it. 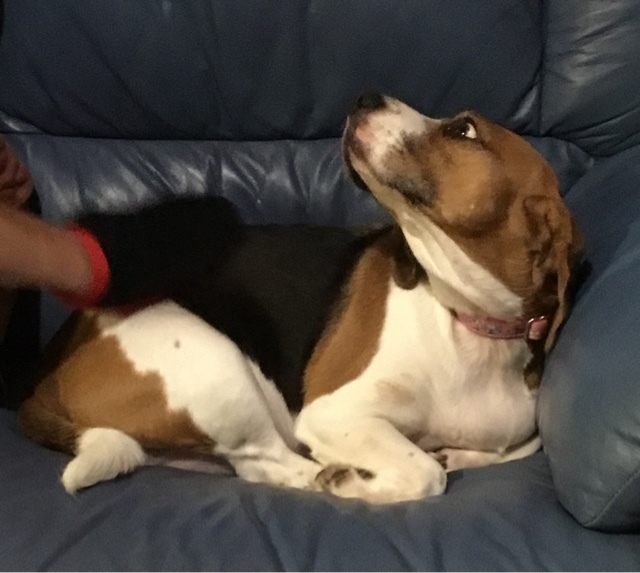 Our beagle, Cherry, was rescued from a puppy farm last year and she's a very nervous dog. Objects coming close to her still really scares her, and this includes brushes. We've rarely been able to brush her as she just gets too frightened. I've tried grooming gloves on other dogs in the past without much success, so I wasn't really expecting much from the Mikki Smooth and Stroke Glove. I was wrong - this grooming glove worked brilliantly on Cherry's short coat. But the best result of all is that she actually enjoyed being groomed with it! Cherry happily sat or laid down while we groomed her, and she definitely enjoyed the stroking effect of the grooming glove. She was really relaxed during the whole experience, and didn't get at all scared or stressed. It's nice to know that we'll now be able to take care of her coat without scaring her with brushes etc. Cherry's coat is quite short and the grooming glove got through it with no problems at all. It removed loose hairs and left her coat looking and feeling great. My rough coated lurcher, Bo, has a very long and thick coat that can be hard to groom. He is fifteen years old so he can't stand up for very long while I'm grooming him. The Mikki Palm Pad was easy to work through his coat, and it took a lot less time than it does with my usual brushes. It easily removed any tangles and it got out a lot of dead and loose hair. The added benefit with this brush, is that it straps to your hand so you don't need to hold a handle. I have arthritis so this was ideal for me, as gripping brush handles etc can be painful for me. The Palm Pad didn't slip in my hand at all and was comfortable to hold and use. Bo was happy to be groomed with this, so it couldn't have been scratchy against his skin. I think he was pleased that grooming didn't take quite as long as usual too! I'd definitely recommend the Mikki Palm Pad for dogs with wire and coarse coats. 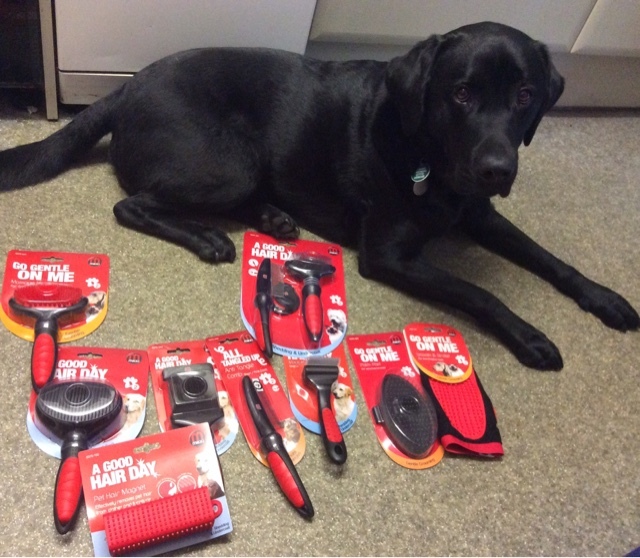 All three of these grooming tools are really impressive, we've been very pleased with the results achieved with them. They are especially good for nervous or older dogs that need a gentler touch. Can you offer these cats their forever home? Today is National Hug Your Hound Day!